Road will serve road users commuting from Sharjah towards Dubai. The Ministry of Infrastructure Development has inaugurated the new road that will serve road users commuting from Sharjah towards Dubai. The road is part of Al Badeaa project implemented by the ministry with the aim to develop the intersection of Emirates and Maliha roads in the Emirate of Sharjah, at a total cost of about Dh200 million. 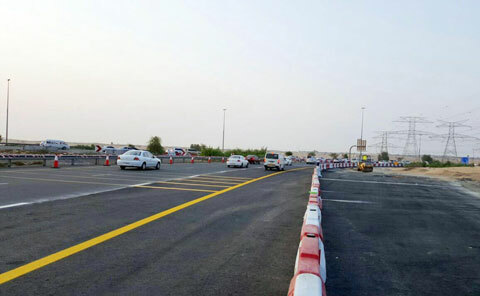 Along the road, three lanes of two kilometres length have been added before the slip road to accommodate those wishing to travel to Dubai. Eng. Hassan Al Mansouri, Assistant Under-Secretary for Works sector at the ministry, stressed the keenness of the ministry to complete the project as scheduled. He noted that Dr Abdullah bin Mohammed Belhaif Al Nuaimi, Minister of Infrastructure Development, had issued instructions at the time when the work began to take measures to complete the project on time by the beginning of the academic year 2016 – 2017, to ensure smooth traffic flow and reduce traffic jams at peak hours. He added that the ministry’s strategy is to link Sharjah with the federal road network, thanks to the directives of the leadership to ensure a decent life for all citizens and residents alike. This news spells relief for commuters who are bracing themselves for the back-to-school morning rush hour traffic that will hit most of the country last week. The new stretch will thereby ease traffic movement towards Maliha Road. The project was rolled out in phases to develop the intersection of Emirates Road and Maliha in Sharjah, which usually faces gridlock during rush hour. The project is expected to finish in its entirety by late 2017. The project consists of three developments, including the construction of a new bridge for ease of traffic movement from Dubai to Sharjah, directed toward the University City. The bridge will comprise three lanes with traffic commuting in one direction only. The second part of the project will be a new exit from Sharjah to Dubai, comprising three lanes. The third part of the project will be an extension of the existing bridge at the intersection of Emirates road and Maliha road. There would be three to seven lanes divided into five main lanes and separate exits, plus another two lanes for those wishing to return.